(Nanowerk News) The change-over to lead-free products is in full progress. The problem is however that the environmentally friendly alternatives have to be as effi cient as the lead-containing variants. One example is the injection system of diesel engines. Lead-free functional materials can be found faster by means of computer simulation methods. Technical progress in the automobile industry is unbroken. But, the sector has still some hard nuts to crack: "Lead-free materials" is one of the challenges – hidden behind this challenge is a EU environmental directive which, based on a step-by-step plan, gradually bans all lead-containing materials and components from automotive vehicles – such as piezoelectric components. These elements are important for diesel engine injectors, for example, which control the supply of fuel to the combustion chamber. 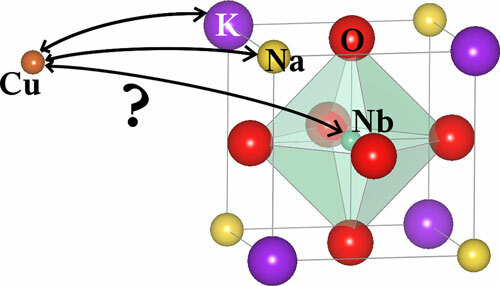 Computer simulation can calculate the possibilities of doping ferroelectric materials, such as potassium-sodium-niobate (KNN), with foreign atoms, such as copper (Cu). "We have to chemically and physically modify the potential candidates in such a way that in the end the replacement materials behave similarly well as the PZT", says Professor Dr. Christian Elsässer, group leader at the IWM. A candidate such as this is potassium-sodium-niobate (KNN). Like PZT it is a ferroelectric monocrystal, but as technical ceramics with uncontrolled atom vacancies and grain boundaries in the crystal lattice, KNN is initially useless as a material. "For this reason, we have to make a virtue of necessity and have to introduce the right doping, i.e. foreign atoms, in order to improve the properties of the ceramic KNN," says Christian Elsässer. Where and how these doping atoms have to be introduced is figured out by the researchers by means of computer simulation: Different ferroelectric properties are obtained depending at which position of the crystal lattice the foreign atoms – such as copper – are placed. "At one position, the copper donates electrons, at another position it prefers to accept them. Dipoles are formed or they are not formed depending on the lattice position," explains Christian Elsässer. These solid-state physical parameters and a number of others shall be determined in advance. Researchers do this with the help of "physics in the computer". This is by no means a trivial task because the quantum mechanical computations require complex atom model systems and big computer capacity. But on the other hand, a lot of time and money can be saved in the development of materials, because on the one hand fewer synthesis and analysis experiments in the laboratory are required. On the other hand computer simulation also produces important thermodynamic parameters for the sintering process, such as pressure and temperature ranges at which the components have to be manufactured. "The engineers receive synthesis instructions for the material at the same time," says the researcher. In this way, the automobile industry can achieve the lead-free target faster. But not only this sector profits from Fraunhofer technology. Lead-containing materials are also present in frequency filters of mobile phone or in mechanical sensors and actuators. Ferroelectric capacitor components are competitive in the race for records when it comes to saving ever bigger data volumes on the smallest of space.